For Canadians, figuring out where to invest in the United States can sometimes feel like an exercise in second-guessing what the 45th American president will say or do next. How difficult is it to invest in exchange-traded funds (ETFs) that either take advantage or protect against the policies coming out of the White House? Political leaders are, in general, short-term players within the context of a long-term investment strategy, says Mr. Vandermeer. He cautions against investments that bank too much on political figures and ideologies that may be here today but gone tomorrow. As an example, he cites the Point Bridge Gop Stock Tracker ETF – its ticker symbol MAGA is an acronym for Mr. Trump’s “make America great again” platform – whose claim to fame is that it favours companies whose executives and employees have donated to Trump Republicans. 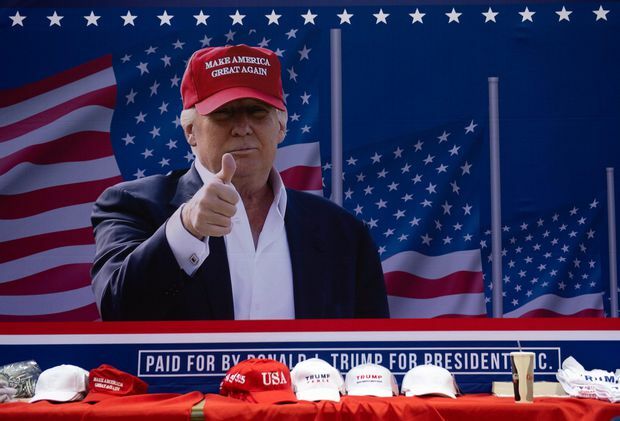 A photo of U.S. President Donald Trump sits behind a table full of campaign hats as he speaks during a campaign rally in Florida in July. Better ETFs to consider would be those with a strong focus on U.S. agriculture – such as the iShares Global Agriculture Index ETF (COW) – and infrastructure. These sectors stand to gain from Trump policies, says Mr. Vandermeer. Jeff Kaminker, president and chief executive officer at Frontwater Capital Inc., a boutique investment management firm in Toronto, says investors who want to take into account Mr. Trump’s “make America great again” policies should look at ETFs with a large concentration of U.S.-based companies that derive a large portion of their revenue from American customers. “One route is to choose ETFs that invest heavily in U.S. small-market-cap companies with little to almost no foreign exposure,” he says. One such ETF, says Mr. Kaminker, is the iShares Russell 2000 ETF (IWM), which is made up largely of U.S.-based companies with market capitalizations of less than $2.7-billion and little exposure to international markets. For an ETF that aligns with Trump policies that support infrastructure growth in the U.S., Mr. Kaminker points to the iShares U.S. Infrastructure ETF (IFRA). While it’s a good idea to invest in the sectors favoured by Mr. Trump’s policies, Canadians shouldn’t overlook ETFs that are based on broader indices, notes James Gauthier, chief investment officer at Toronto-based Justwealth Financial Inc., which provides an online portfolio management platform. The U.S. market has soared since Mr. Trump came into power, says Mr. Gauthier. For investors looking for ETFs that tap into this growth, he suggests the Vanguard S&P 500 Index ETF (VFV). ETFs that focus on sectors such as railways and airlines are also worth a look because they could get a boost – now that Canada-U.S. trade is sorted out – from the expected increase in cross-border business between the two countries, says Mr. Lee. But just as investors shouldn’t put all of their eggs in one basket, neither should they let the Trump factor weigh too heavily on their investment decisions, says Todd Schlanger, senior investment strategist at Vanguard Investments Canada Inc.
Policy-driven events, such as NAFTA’s renegotiation, don’t always affect markets as expected, says Mr. Schlanger. That’s why investors need to stay focused on the long term and not react too quickly to what’s happening. “An example is Brexit, which turned out not to be as significant an event as people believed,” he says. Similarly, while Trump’s promise to dismantle NAFTA created market volatility leading up to and during negotiations, the outcome isn’t likely to have a big impact on investors in the long term. Investors also need to keep in mind that Mr. Trump’s policies could be short-lived, says Mr. Gauthier at Justwealth.